....As I told you in the past, I am very happy with my Freebooter boat and definitely will not want to miss out to sing its praises and help you to spread the word. The only thing I am really falling short of --- is pictures. It seems like, since I am always anxious to get in the boat, I never take the time to take a few shots. Being a small family with a seven-year-old boy, I was dreaming of a versatile (sail, row, motor) easy on the budget and pleasing to the eye boat. I spent the better part of one year visiting boat shows, studying magazines and surfing the web. There were many times, that I almost signed a purchase order, for what would have been a compromise in one way or the other. Either the boat was too expensive, too small, too big, could not be rowed, or could not be sailed. Then in early 2001 I literally stumbled upon Freebooter's web page and was immediately taken in by the beauty, versatility and last not least the fair price of the boat. Without having ever seen the boat, or having talked to any other owner, I took the plunge and immediately placed an order with Chris for a pretty decked out version (sail, deck, wood floor). After five month of waiting the boat, was delivered via truck to my home in the Chicago area. The minute, I peeled back the packaging, I knew I had made the right choice and bet my trust on the right man. The boat was everything I had ever hoped for and better. The craftsmanship from the glasswork to the woodwork was outstanding and I received every bit I was promised. By nature I am a perfectionist --- and to fault anything on this boat, would be nothing short of nitpicking. Fast forward --- in the meantime --- we have two summers of nothing, but pure joy under our belts. 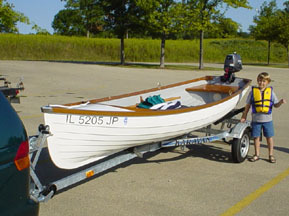 I have fitted the boat with a 4 HP Nissan four stroke outboard and keep it on a trailer in my garage. On a moments notice (even after work) I hitch the boat to our family car without a fuss and head for the next lake or river. The boat performs flawless under power, sail and oars. It tracks straight like an arrow and handles rough and choppy waters extremely well, even the wakes of the show off Bayliner crowd. We have crossed Lake Winnebago, which happens to be the largest inland lake in Wisconsin and toured the Wisconsin River and many others . There has never been a moment that we have felt unsafe in this boat in spite of its size. One thing however --- you must love to socialize --- because you cannot take out this boat without getting involved --- from comments on its beauty to inspections of every inch of its hull, there will always be people wanting to know, where you got this beauty. As a busy manager, I was realistic about the time, I have available for boating --- this boat was the perfect choice, for having some relaxing hours & fun on the water. Because there is no guilt feeling, of under utilizing a major investment as it is often with a larger boat --- this boat did not break the bank and is just sitting in my garage costing nearly nothing, when idle. All in all this boat was the perfect experience --- from the people to the product.